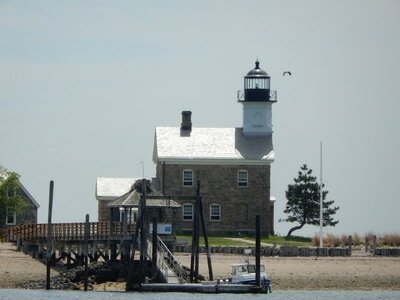 Norwalk Seaport - Cruises to Sheffield Island, Long Island Sound Cruises, Rent Sheffield Island! - FAIRFIELD COUNTY "IT!" The party begins with a ride out to Sheffield Island aboard the CJ Toth ferry where unique birthday cocktails and appetizers from the popular Blind Rhino restaurant in Norwalk will be served, then arriving at Sheffield Island to continue the celebration with food, drinks, music by The New Orleans Beatnicks, and Birthday cake for all! The cost is just $50 and limited to 49 guests at the party and expected to sell out quickly. We need a lot people to help us blow out the 150 candles on the cake!. From May through September, visitors can board the Seaport Association's 45-foot C.J. Toth catamaran for a cruise to the island then tour the lighthouse, observe wildlife in their natural habitat in the Stewart B. McKinney National Wildlife Refuge, hunt for shells along the beach, dine on a picnic lunch, play on the lawns around the lighthouse and just have a good time. Visitors can board the Seaport Association's 45-foot C.J. Toth catamaran Wednesday evenings for a relaxing 2 hour cruise through the Norwalk Harbor and Long Island Sound listening to relaxing music while you take in one of the most exciting tours that the Norwalk Harbor Islands area has to offer providing unique views of the city and the surrounding waterways. ​Every summer, the Norwalk Seaport Ferry in South Norwalk carries hundreds of hungry passengers to the historic 1868 Sheffield Island Lighthouse for the Norwalk Seaport Association's famous Thursday Clambakes. A true New England dining experience, the evening allows participants to dine in the festive tented pavilion on the lighthouse lawn, with tours of the lighthouse itself included in the cost. Roundtrip cruise and dinner is either $65 or $79 per person, depending on entree. Vegetarian options available. Advance registration only. In lieu of the choice of "Main" items, you will get a 1.5 lb Hard Shell Lobster and everything else listed on the menu. ​Sun, sea breeze and beautiful wildlife make a perfect combination and that's just what the Norwalk Seaport Association offers up in its bird-watching. Set to depart from the Seaport Dock adjacent to the Stroffolino Bridge at the corner of Washington and Water streets in South Norwalk, the 45-foot C. J. Toth Quest catamaran will take participants on a up close, two hour cruise of the Norwalk Islands. Join Larry Flynn, Master Wildlife Conservationist, CT DEEP, Division of Wildlfe, to explore and understand the importance of the Norwalk Islands, and it's many migratorial bird species. You will visit thousands of birds at a safe distance, nest sites and nesting colonies of Ospreys, Egrets, American Oystercatchers, Herons, Terns, Gulls, Cormorants and many more.